TH E M R EP O RT | 57 O R I G I NAT I O N S E R V I C I N G DATA G O V E R N M E N T S E C O N DA R Y M A R K E T THE LATEST GOVERNMENT Looser Underwriting Is the Name of the Game in 2017 The OCC reports increasingly looser lending at banks and federal savings associations over the past four years. T he vast number of poorly underwritten mortgage loans leading up to the crisis caused banks to tighten up their stan - dards and generally make loans only to those borrowers with pristine credit. In the last few years, however, those tight post-crisis underwrit - ing standards put in place by banks are beginning to relax a bit. The Office of the Comptroller of the Currency's (OCC) 22nd Annual Survey of Credit Underwriting Practices, released December 20, found that underwriting standards had relaxed for banks and federal savings as - sociations for the fourth consecutive year. Much like in 2015, residential real estate loans, conventional home equity, commer - cial real estate loans, and direct consumer loans were among the areas that experienced the greatest amount of change, according to the OCC. The survey covered the 12-month period ending June 30, 2016, and covers aggregate total assets of $10.2 trillion and $5.2 tril - lion in gross loans—approximately 90 percent of the loans in the federal banking system (across 93 national banks and federal savings associations), the OCC reported. "During the 12-month survey period, underwriting practices remained satisfactory. 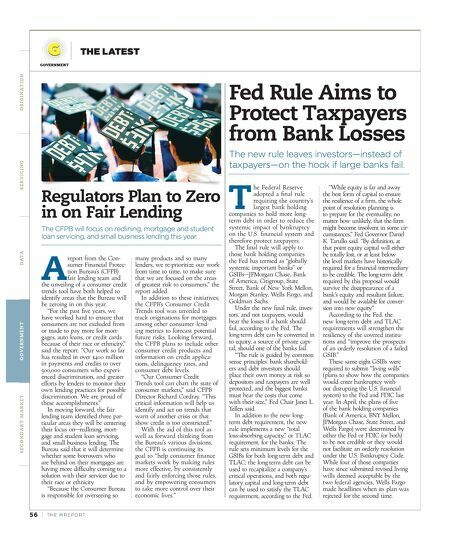 But an in - creasing tolerance for looser under- writing has resulted in a continued movement from more conservative to more moderate underwriting practices," said Grace Dailey, Senior Deputy Comptroller and Chief National Bank Examiner. "While this movement is consistent with past credit cycles at a similar stage, credit risk is expected to increase if the trends we see today continue." According to the OCC, the easing underwriting standards indicate that banks have a greater risk appetite and a greater desire for loan growth. "Examiners reported that the leading reasons for eased under - writing practices since the 2015 survey are increased competi- tion, higher credit risk appetites, and perceived improvements in general economic conditions," the report stated. "Banks generally tighten underwriting practices when the economy contracts and ease underwriting practices when the economy expands. Since 2012, examiners have cited these rea - sons, along with the existence of abundant market liquidity, for the eased underwriting practices." 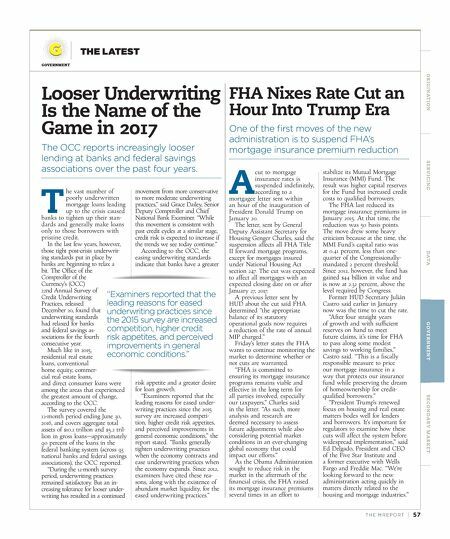 FHA Nixes Rate Cut an Hour Into Trump Era One of the first moves of the new administration is to suspend FHA's mortgage insurance premium reduction A cut to mortgage insurance rates is suspended indefinitely, according to a mortgagee letter sent within an hour of the inauguration of President Donald Trump on January 20. The letter, sent by General Deputy Assistant Secretary for Housing Genger Charles, said the suspension affects all FHA Title II forward mortgage programs, except for mortgages insured under National Housing Act section 247. The cut was expected to affect all mortgages with an expected closing date on or after January 27, 2017. A previous letter sent by HUD about the cut said FHA determined "the appropriate balance of its statutory operational goals now requires a reduction of the rate of annual MIP charged." Friday's letter states the FHA wants to continue monitoring the market to determine whether or not cuts are warranted. "FHA is committed to ensuring its mortgage insurance programs remains viable and effective in the long term for all parties involved, especially our taxpayers," Charles said in the letter. "As such, more analysis and research are deemed necessary to assess future adjustments while also considering potential market conditions in an ever-changing global economy that could impact our efforts." As the Obama Administration sought to reduce risk in the market in the aftermath of the financial crisis, the FHA raised its mortgage insurance premiums several times in an effort to stabilize its Mutual Mortgage Insurance (MMI) Fund. The result was higher capital reserves for the Fund but increased credit costs to qualified borrowers. The FHA last reduced its mortgage insurance premiums in January 2015. At that time, the reduction was 50 basis points. The move drew some heavy criticism because at the time, the MMI Fund's capital ratio was at 0.41 percent, less than one- quarter of the Congressionally- mandated 2 percent threshold. Since 2012, however, the fund has gained $44 billion in value and is now at 2.32 percent, above the level required by Congress. Former HUD Secretary Julián Castro said earlier in January now was the time to cut the rate. "After four straight years of growth and with sufficient reserves on hand to meet future claims, it's time for FHA to pass along some modest savings to working families," Castro said. "This is a fiscally responsible measure to price our mortgage insurance in a way that protects our insurance fund while preserving the dream of homeownership for credit- qualified borrowers." "President Trump's renewed focus on housing and real estate matters bodes well for lenders and borrowers. It's important for regulators to examine how these cuts will affect the system before widespread implementation," said Ed Delgado, President and CEO of the Five Star Institute and a former executive with Wells Fargo and Freddie Mac. "We're looking forward to the new administration acting quickly in matters directly related to the housing and mortgage industries." "Examiners reported that the leading reasons for eased underwriting practices since the 2015 survey are increased competition, higher credit risk appetites, and perceived improvements in general economic conditions."